For purchases the correct VAT rate should appear on the supplier’s invoice. 3.  Check the ‘Include VAT Late Claims’ box to include late claims on the return, provided you have published your previous period’s return. 5. Click the VAT Audit Report tab to see all the transactions making up totals on the VAT Return. Scan down the list to make sure the sales and purchase in the return all look as you’re expecting, with the correct rates of VAT assigned. You may wish to ask your adviser to do this sense check for you. 6. 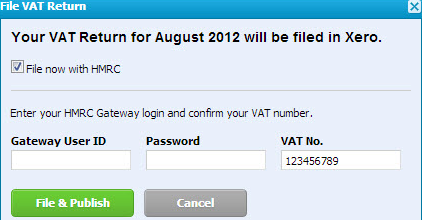 Click the File VAT Now… button at the bottom of your VAT Return. 7. Confirm the VAT No. you are using is correct, enter your Gateway User ID and password, and click the File & Publish button on the File VAT Return screen. 8. Check the status of your filed VAT return with HMRC. Go to Reports>All Reports. Xero displays filed returns under the Filed with HMRC tab and shows the return as Pending. This is because it has been sent to HMRC but they haven’t processed it yet. Once HMRC has processed your return its status will change to Filed or Failed. If your status is Failed, click on the VAT Return link to read the error message, or read the notification in your Xero inbox. Go back to Xero Guidance home page.